If you look closely at this map, you will see the Kingdom of Romania pre- 1919. It is important to note that this is the combination of two principalities of Wallachia and Moldavia. When this happened, the Princedom of Romania was formed. At this point there was no King, but rather a prince or Domnitor. 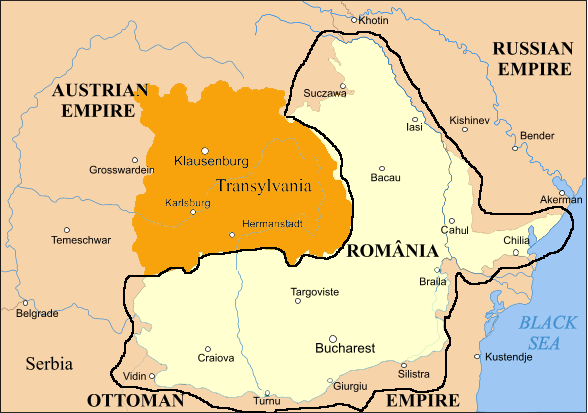 Over time, the Romanians of Transylvania sought more freedom, and they wanted to unite with Romania and to form greater Romania. This would not happen until after the Great War, now known as the First World War. In 1918, in the city of Alba Iulia, the people held a vote, and after the end of the First World War the many ethnic groups ( most notably the Romanians and Saxons) of Transylvania voted to unite with the Kingdom of Romania.